Condo MH605 - Boundless Recreation for the Outdoor Enthusiast! Welcome to Moose Hollow 605! 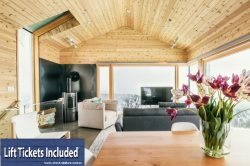 Spend your vacation in this cozy mountain retreat where you will enjoy close proximity to the pool/hot tub, endless outdoor recreation, and easy access to North America's largest ski area, Powder Mountain. MH605 is the perfect place to relax after a day of water skiing, mountain biking, or snowboarding, whatever you passion, it is all within reach! Main Level: Kitchen, living room with TV (with sofa sleeper), fireplace, full bathroom, balcony, and bedroom. Upstairs: One master suite bedroom with ensuite bathroom and laundry room. Bedroom 1: 1 Queen bedroom with full hallway bathroom. Bedroom 2: 2 Queen beds with ensuite bathroom. We are truly excited and honored to share our homes with each and every guest and we invite you to stay with us at Powder Mountain Getaways - MH605!